I ♥ pastry dough. Yes, it’s a little intimidating at first, but once you master the basics it will become one of the most versatile things in your culinary repertoire. Butter, flour, salt, and ice-cold water are all you need to make an irresistible flaky crust for sweet and savory dishes. Inspiration for this tart came from my one of my favorite summer desserts: berry tart with mascarpone filling. I wanted to make a cold weather version that could (a) satisfy a mean craving for mascarpone (a sweet Italian cheese that is similar to cream cheese) and (b) satisfy an even greater craving for pastry dough. Have I mentioned that I adore the stuff? Poaching pears couldn’t be more simple and it never fails to deliver spectacular results. The most important thing to remember: control your heat. Poaching is a gentle cooking technique that refers to cooking food in a liquid below the boiling point. In short, if you see bubbles reduce your heat. After poaching the pears, let them cool in the poaching liquid for a really gorgeous tart. The pears will turn an even deeper burgundy and the flavor will be that much better. Also, select pears that are just firm to the touch. 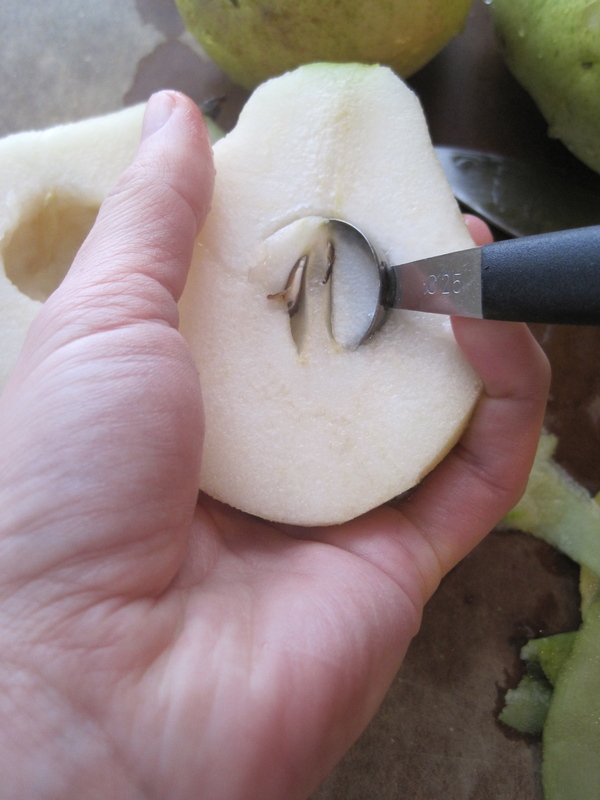 Ripe pears tend to get a little mushy as they poach. 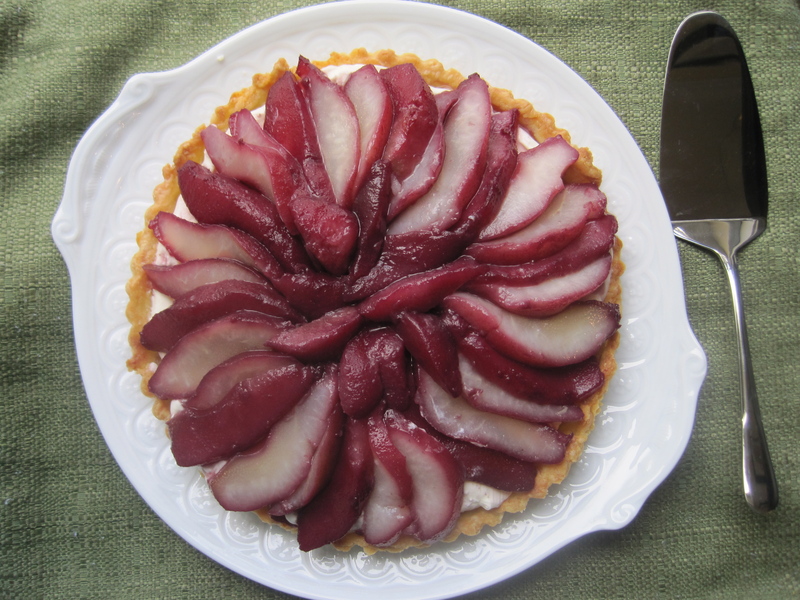 Full disclosure: While my intention was to make this tart on the day I purchased the pears, life happened and tart-making got delayed a couple of days. 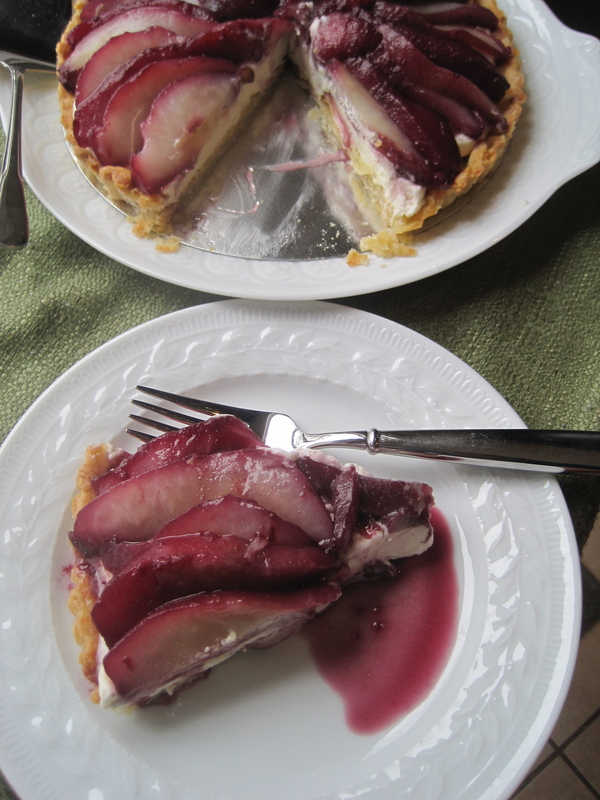 The tart was still delicious, but the pears became a tad softer than I would have liked. If you look closely, you might be able to see the difference in the pictures. Regardless, I had no problem eating a slice several slices of this sumptuous tart. On a well-floured surface, roll out the pastry dough in the shape of a large circle (about 13-inches in diameter) and ¼-inch thick. 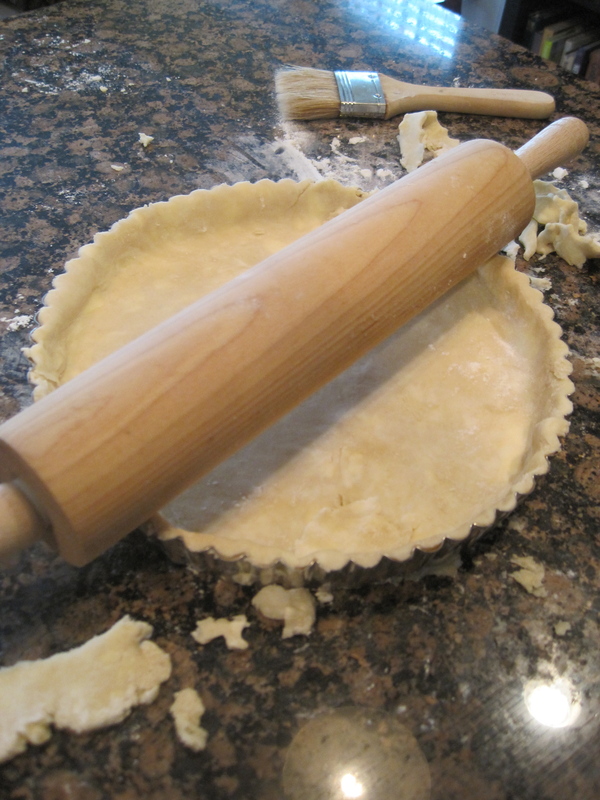 Place the rolling pin in the center of the circle and fold one half of the pastry dough over the rolling pin. Pick up the rolling pin and transport the pastry dough to a 10-inch tart pan. Trim and adjust the pastry dough as needed so that it fits in the tart pan. 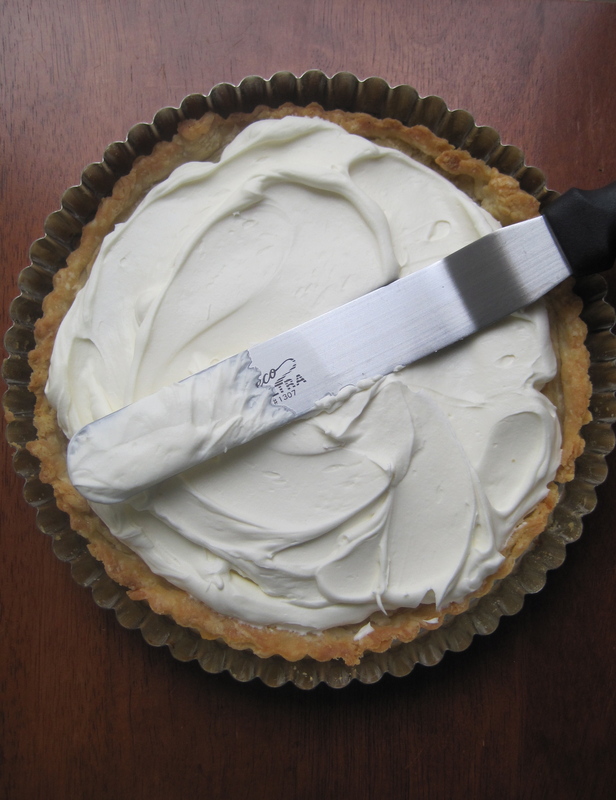 Kitchen shears are great for trimming pastry dough. Refrigerate for 15 minutes. 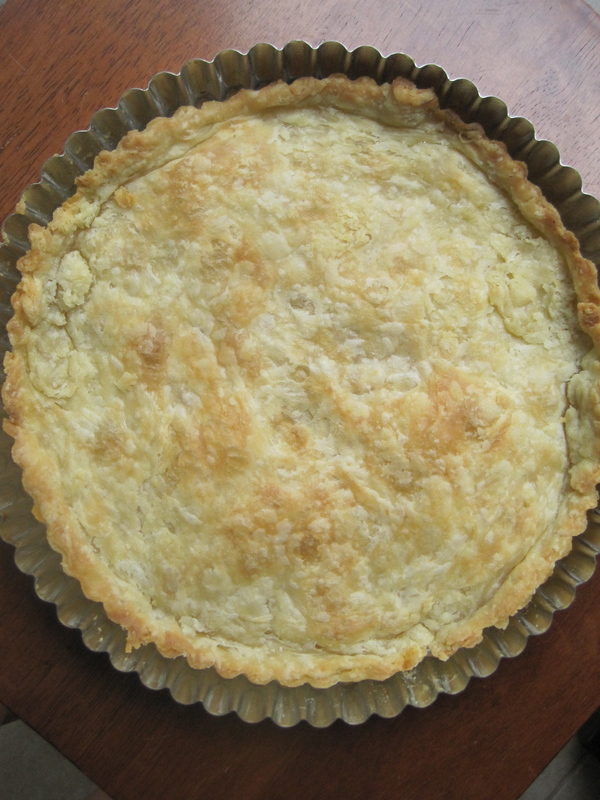 Place a sheet of parchment paper over the tart and top it with pie weights or dried beans. Bake the tart for 15 minutes then carefully remove it from the oven and remove the pie weights and parchment paper. Return the tart to the oven and bake for another 10 minutes or until golden brown. Remove the tart from the oven and cool completely on a wire rack. In a small saucepan, bring the red wine, granulated sugar, and cinnamon stick to a simmer. Add the pears and simmer for 20 minutes. 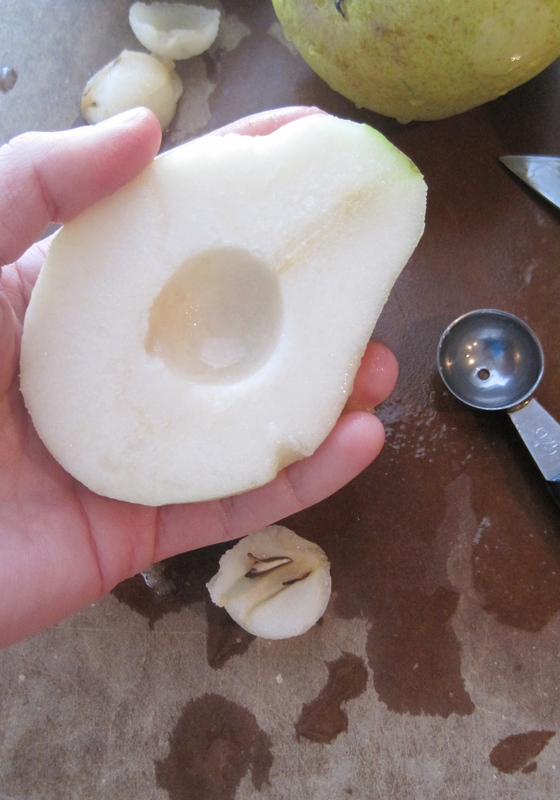 Remove the pears from the poaching liquid and allow them to cool. Reduce the poaching liquid by half and set aside to use as a sauce for the tart. 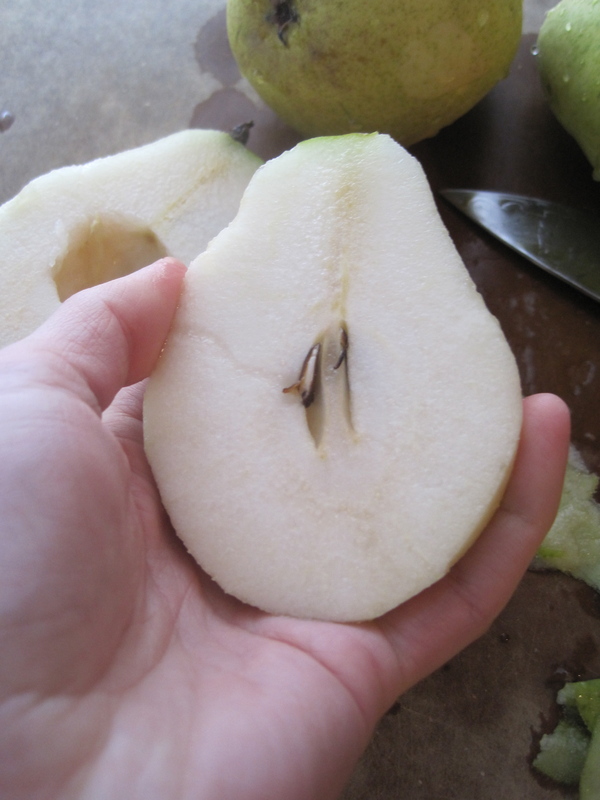 Once the pears have cooled, cut the pears into ¼-inch slices. 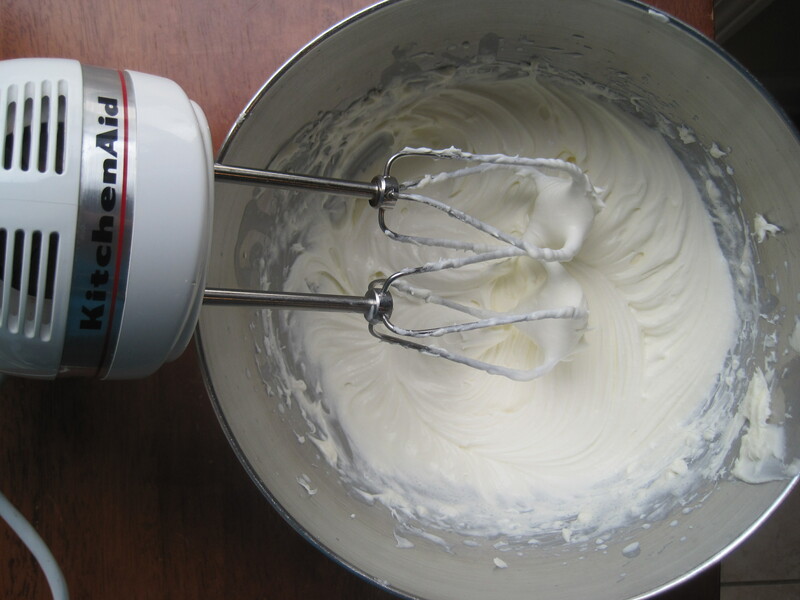 In an electric mixer with a whisk attachment, beat the mascarpone, heavy cream, and sugar just until fluffy. Don’t overmix; mix just until the heavy cream is incorporated into the mascarpone. 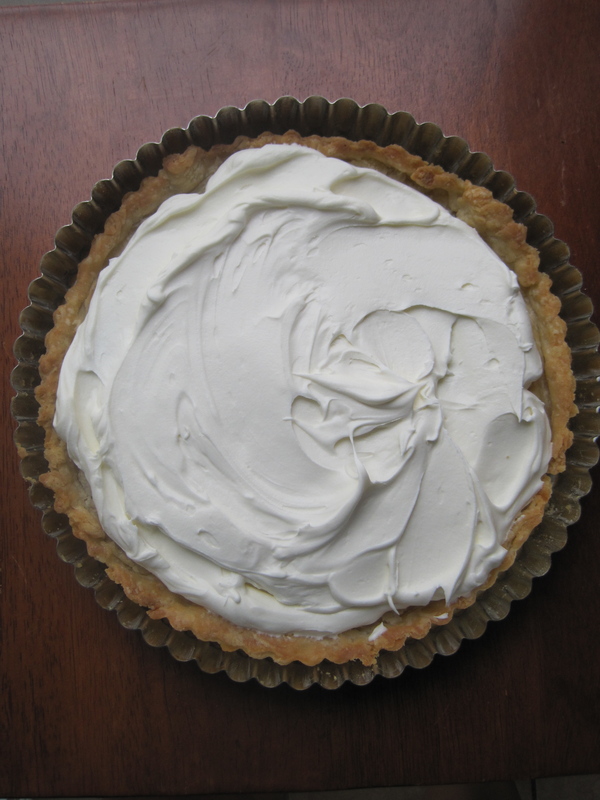 To assemble the tart, spread the mascarpone filling over the bottom of the cooled tart shell. Slice the poached pears and arrange the fruit on top of the mascarpone filling as desired. Serve each slice of tart drizzled with a little of the red wine reduction sauce. Making pastry dough by hand: In a large bowl, whisk together the flour and salt. Cut the 8 tablespoons of butter into small cubes. Use two forks or a pastry blender to cut the cold butter into the flour mixture until the fat is in small lumps. Sprinkle the ice-cold water over the flour mixture and use a fork to pull the mixture together. Add up to 1 more tablespoon of water, in teaspoonfuls, if the dough is not coming together. Turn the dough out on the counter and, working quickly, mold it into a large ball. Press the ball into a 5-inch disc. Wrap the dough with plastic wrap and refrigerate for at least thirty minutes and up to one day. Use as directed in the recipe. Using a food processor: Combine the flour and salt in a food processor and pulse to combine. Cut the butter into small cubes. Add the butter and pulse until the butter is in pea-sized pieces. Slowly add the water while pulsing. Continue to pulse until the dough comes together. Turn the dough out on the counter and, working quickly, mold it into a large ball. Press the ball into a 5-inch disc. Wrap the dough with plastic wrap and refrigerate for at least thirty minutes and up to one day. Use as directed in the recipe. Holy cow, this sounds amazing. It also looks very nice with all the colors. Let me know if you need any testers! ha.